Many of the coolest features on high-end Android phones weren’t developed by the phone manufacturers or Google, but are technologies that were developed by Qualcomm for its Snapdragon line of mobile chips. For instance, that nifty turbo charging feature available for Motorola and HTC phones? That was enabled by Qualcomm. This past year, essentially every high-end Android phone, including the [company]Samsung[/company] Galaxy S5, the [company]HTC[/company] One M8, the [company]LG[/company] G3, the [company]Motorola[/company] Moto X (2014), and the [company]Google[/company]-designed Nexus 6, all were based around the Qualcomm Snapdragon 801 and 805 chips. And next year, you can expect all those companies to come out with new devices, only running the Qualcomm Snapdragon 810, an improved version, instead. This past week, Qualcomm revealed some of the things its new smartphone and tablet chip can do. 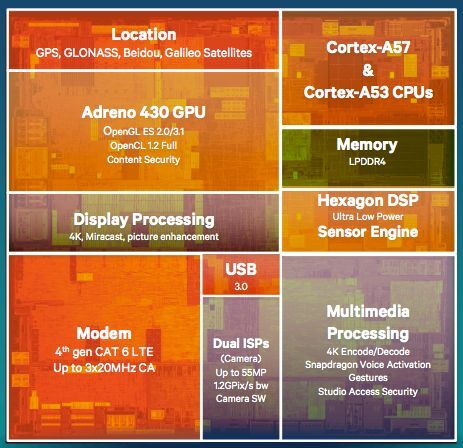 We already knew the octa-core chip based around 64-bit ARM Cortex-A57 CPUs and Cortex-A53 CPUs is bringing modest speed and battery improvements as well as an improved modem — but it’s also got a few new features that aren’t simple performance gains. If you’re buying a new Android phone in the next year, pay attention, regardless if you’re going with Samsung or HTC or Motorola. There are no guarantees, of course, but there’s a good chance these features end up in your next handset. [company]Qualcomm[/company] made that feature possible in the Snapdragon 800 with its DSP, and they’re pushing hot words even farther. New devices will have the ability to passively listen, using only a small amount of power, for more than just the word “OK.” Qualcomm calls this feature Snapdragon Sense. The first feature it will enable is a much faster Shazam search. So if you find yourself too slow on the draw when trying to identify unfamiliar music, you’ll love this: When you boot up Shazam, it’ll already have been listening just a little bit, so it can identify the song in a few seconds. Although the most pixel-dense smartphone screens currently check in at 2560 x 1440 pixels, there are an increasing number of smartphones equipped with cameras that shoot video at 4K resolution. Expect that to become a mainstream feature next year. Qualcomm’s latest processor will be able to output that pixel-dense video to a TV, either through a wired connection or wireless adapter using WiGig, without lagging or stuttering. And it’s not out of the question that there could be some tablets with 4K screens, either. I saw Qualcomm’s 810 reference tablet — which costs $999 and definitely isn’t for consumers — outputting 4K video with aplomb on a 10-inch screen. High-end Android tablets could have 4K screens next year, but they probably won’t be cheap. 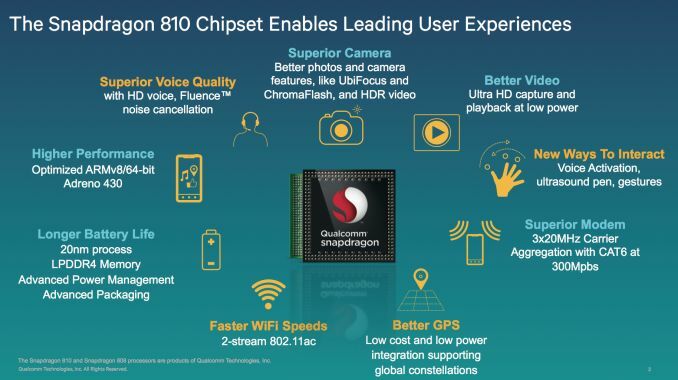 The Snapdragon 810 will be the first 64-bit processor in Qualcomm’s 800 series, and coincides with Android 5.0 support for a 64-bit runtime. End users might not see that much of a difference right away, but for developers it will make porting games and making apps less complicated in the long run. It also has the potential to improve fingerprint scanning and facial recognition software. More noticeable to consumers will be the upgraded GPU, the Adreno 430, which will be able to output gaming graphics to televisions that starts to rival last-generation consoles. Earlier this year California and Minnesota passed laws requiring smartphones to come with a “kill switch,” or a way to render the device unusable if it’s stolen. You can expect other states to follow suit soon. Google has introduced its own antitheft features in the latest version of Android, but Qualcomm believes it can help address smartphone theft at a hardware level, because it designs the chips that Android runs on. The Snapdragon 810 will have hardware-level security features — including the ability to remotely lock phones as well as unlock them if they’re found. In addition, Qualcomm is adding extra security to prevent phones from being flashed and wiped once they’ve been stolen. When will devices come out? Qualcomm promised that devices running the Snapdragon 810 will hit the United States market in the first half of 2015. But some expected the chip to be included in the Nexus 6 (for 64-bit support) and it wasn’t ready in time. Additionally, Korean papers have reported that Qualcomm delays threaten Samsung’s release schedule for the Galaxy S6. So we’re still waiting to see whether we’ll see the first devices early in 2015 or a little bit closer to summer. Funny how everybody just decided this morning to present us the SP 810 , without any new info. Why is everybody publishing non-news just because some marketing team is pushing the info and why is Qualcomm trying so hard? And maybe they shouldn’t advertise the always on voice and kill switch features, the only ones getting excited about that are abusive govs. Btw, we’ll see 4k phones next year not just tabs, few but there should be some even if this chip and pretty much all others should be utterly inadequate for that (being able to push 4k doesn’t mean it can do it well enough).